I said in class that errors are normal and part of the learning process. Therefore, it doesn't make sense to avoid errors by staying silent in class all the time. The German dictionary "Duden" (Germans' main reference when it comes to spelling) offers many information relating to a specific word, including typical nouns and adjectives that are often related to a verb like "lernen". 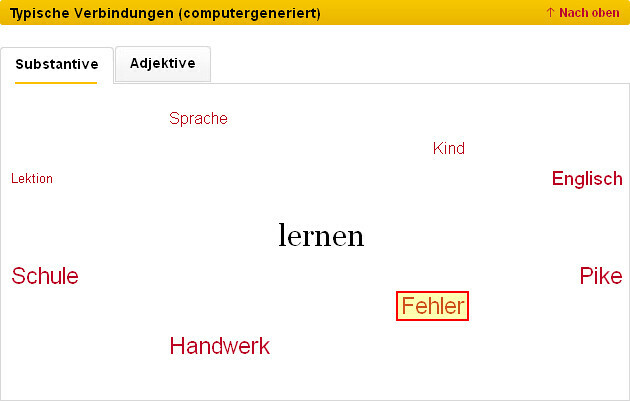 And as you can see on the screenshot (taken from: http://www.duden.de/rechtschreibung/lernen on 17 August 2011), the word "Fehler" (error, mistake) is commonly related to the verb "lernen". Posted in Allgemein on 17. August 2011 by .